Do you wish you had a fast PC? Have you shown too much tolerance towards your lazy PC?. SLOW-PCfighter offers a free scan and and seeks out all unused entries in your registry from failed software and driver installations, faulty uninstallations and disabled drivers and optimizes Windows start-up. 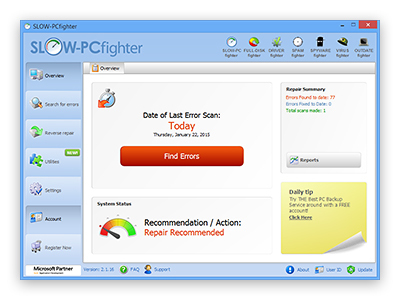 Implemented with the latest technologies, SLOW-PCfighter will diagnose your PC to find and repair the errors. Avaiable in 20 languages. SLOW-PCfighter is fast and easy to use. Avaiable in English, German, French, Spanish, Italian, Dutch, Czech, Thai, Finnish, Portuguese, Greek, Japanese, Bulgarian, Polish, Turkish, Chinese, Japanese and Danish.